They set out to reconstruct a lost synagogue. They recovered a lost world. When the acclaimed artists/educators Rick and Laura Brown decided that they would reconstruct a magnificent, 18th century, Polish wooden synagogue in Poland, even those who knew this remarkable couple well doubted it would ever happen. 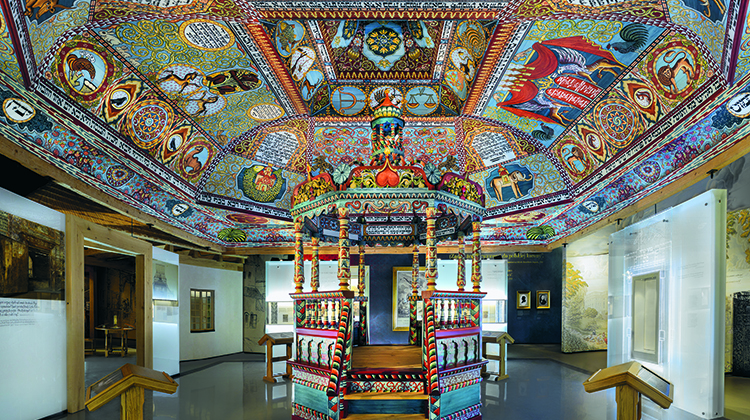 After working for ten years with hundreds of students, educators, scholars and craftsmen, the Browns’ Gwozdziec synagogue reconstruction project has become the iconic centerpiece of the new POLIN Museum of the History of Polish Jews in Warsaw. Raise the Roof is the story of this epic journey. I invite you and your community to join us for a very special screening of Raise the Roof at the Pittsburgh Jewish Film Festival at 5;30 pm on April 12, 2016 at the Manor Theater. On this page you will find links to all the information you need to buy tickets and learn more about the film, the filmmakers, and the creators of the Gwozdziec synagogue reconstruction project. You can also find links to the Raise the Roof press kit, a poster to print and pin up and a link to arrange special screenings for your synagogue, church, school or community group. See you at the movies! Cary Wolinsky, Producer of Raise the Roof cary@trilliumstudios.com. SYNOPSIS: Artists Rick and Laura Brown are not Jewish and not Polish, yet they set out to rebuild Gwoździec, one of the magnificent 18th-century wooden synagogues of Poland, the last of which were destroyed by Nazis during World War II. Their vision inspires hundreds of people to join them, using their hands, old tools and techniques to rediscover Gwoździec’s history, culture and art. Raise The Roof follows the Browns and the Handshouse Studio team to Sanok, Poland, as they begin building the new Gwoździec roof. The crew has six weeks to hew, saw and carve 200 freshly logged trees and assemble the structure. Working against this deadline and despite torrential downpours and exhaustion, the team must create the structure, and disassemble it again for shipping and eventual installation. To paint the intricate ceiling murals, the Browns face another challenge: the 1914 photographs of Gwoździec are black and white and there is only one, small color study called the Breier. Using that as their Rosetta Stone, the Browns slowly build a library of Gwoździec’s colors. Armed with pigments and stacks of wooden boards, the team sets up to paint the ceiling mural in what seems to be an art gallery in Rzeszów, Poland. In fact, this building and those in seven other Polish cities where they will work during the summers of 2011 and 2012, are all former or active masonry synagogues. Each Handshouse-trained painting leader is tasked with creating the mural’s most iconic images, training students to paint thousands of flowers and vines. Why were the Jews of this time willing to break the Second Commandment prohibition against graven images when decorating this building? Raise the Roof takes us on a journey of discovery. The reconstructed Gwoździec roof is now the centerpiece of the POLIN Museum of the History of Polish Jews in Warsaw.